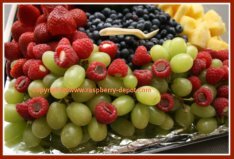 If you are looking for recipe instructions and photos of the Best Fruit Tray to make for a crowd, here is how I made a fresh fruit platter for a large group today. I made this for a group of about 25 people. Perhaps you are making a tray of fruit for a Wedding, a Shower, a Christmas Party, a New Year's Eve celebration, or any special occasion. Everyone loves healthy fruit...and dip! A Do It Yourself / DIY Fresh Fruit Presentation! I made this platter of fresh fruit with my daughter, Karissa, for a potluck supper following the baptism of our dear grandson Matthew. 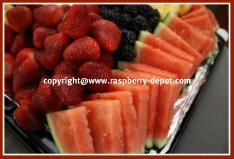 Putting a party tray together is really very simple, quick, and is much less expensive than purchasing a store-made tray of fruit. Homemade fruit trays are also fresher, and...you can pick the types of fruit! 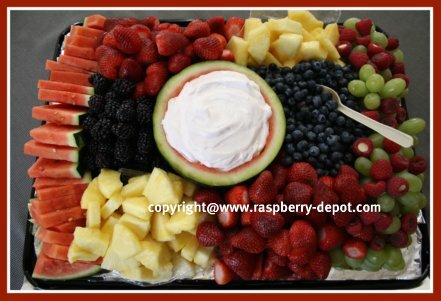 Ideally you should make this fresh fruit platter the day of, or the day before the day you plan to serve it. I would advise that you make it no earlier than 24 hours prior to serving time. When making a fruit tray, there are no "rules", and all fruit trays turn out a little different, depending on the fruit which is "in season", or ripe at the time. So, be creative! I needed to make a fruit tray for about 25 people, and this is how I made the tray of fresh fruit in the photo above. Choose a large tray, and cover it with aluminum foil. You can also use a disposable, store-purchased tray with a lid, however, as you can see from the photo, a large fruit tray is quite heavy, so you will need to add a large baking sheet or something similar underneath to support it! The dimensions of the tray in the image is 15" x 20". Choose the types and quantity of fresh fruit which you would like to include on the tray. Here is the list of what I used to make the tray in the photo above. 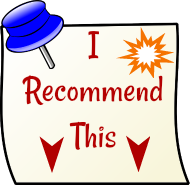 You can very easily substitute different fruit, and vary the quantity of each fruit type according to your likes and dislikes, or in consideration of the fresh fruit available at the time you are making the fruit platter. 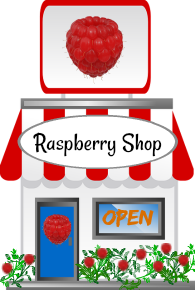 What a great idea - add white chocolate and milk chocolate chips for garnishing inside the raspberries (see them in the photos)! 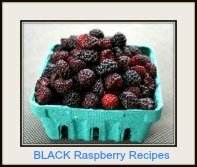 wild black raspberries, kiwi, red or black grapes, cantaloupe, honey melon, apples. Note - if you plan to use apples for the fruit tray, you should prepare them, and add them to the tray only about 6 - 8 hours prior to serving the tray. Apples should be cored and sliced, but the peel left on, and then treated to help prevent, or slow down, the browning of the apples. Prepare each of the different fruits as needed. Strawberries, raspberries, blueberries, and grapes simply need to be rinsed gently with cold water. Then, place the rinsed fruit on plates with paper towel underneath to dry for about 10 minutes (see photo). Slice the mini watermelon into small wedges. I hollowed out one half of one of the watermelons with a melon baller, and used that for the fruit dip container. I purchased cored pineapple which only needed to be cut into chunks. Arrange the fruit on the tray. You can copy the way I have arranged the fruit, or create your own design! Cut the plastic sealing part, and one side of a sandwich bag (Example: "ziploc bag"), open it up, and place the chunks of pineapple inside. Make the fresh fruit dip! I used my favourite dip for this fruit tray. 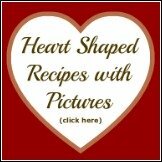 Just TWO ingredients...quick and easy! Cover the finished tray of fruit with a cover or cover with plastic wrap. Store the fruit platter in the refrigerator until serving. Store excess dip in the refrigerator, and fill dip container as needed.